Taken from the intro to our presentation to the Market Research Society of Singapore to be held on 20th November. Data represents a big business opportunity for the creative industries. In this presentation James and Graham examine how and why data should be embraced. How do you photograph an elephant? 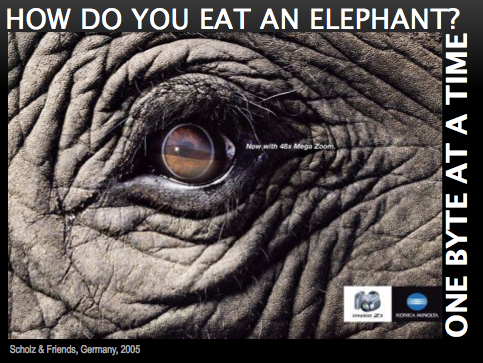 Just as the old saying goes, “What’s the best way to eat an elephant? One bite at a time”, we will look at some cases where data has been used to build business and drive communications. Many brands are now feeding data-driven stories to consumers who are hungry for relevant content. We will discuss just three examples. Automation isn’t just about buying cheap, it’s about relevant data collection: Wynn Las Vegas uses data to position itself as a brand and business leader. Data games and game data: Fitness Champ is an example of how games can extend IP, generate revenues, and provide data to shape business direction. The big picture: World Wildlife Fund’s Earth Hour as a case study to show how a not-for profit should, could, and does use data and gamification. Automation and gamification might be today’s buzzwords, but because of the data they provide, they will be tomorrow’s necessities. James and Graham have an interesting tale that only a seasoned adman plus a well travelled entrepreneur could bring to life. If Graham is to data what The Hoff is to lifesaving, does that make me Pammy? Really? 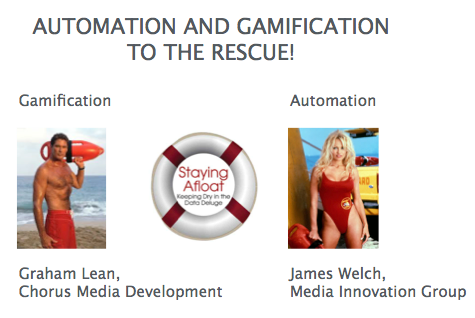 James Welch is Regional Director, Asia Pacific for the Media Innovation Group (MIG). The MIG is powered by 24/7 Media and is a WPP company. Graham Lean is CEO and Founder of Chorus Media Development (CMD). CMD is an APAC video games company specialising in branded gaming.